Obamacare works for the insurance companies, but not for the uninsured. .The government of the “world’s only superpower,” the “exceptional,” the “indispensable” country, claims to know what is best for Syria, Iraq, Afghanistan, Libya, Yemen, Pakistan, Somalia, Mali, Russia, Venezuela, Bolivia, Ecuador, Brazil, China, indeed for the entire world. However, the “indispensable” country cannot even govern itself, much less the world over which the “superpower” desires hegemony. The government of the “world’s only superpower” has shut itself down. The government has shut itself down, because it cannot deal with the budget deficit and mounting public debt caused by twelve years of wars, by financial deregulation that allows “banks too big to fail” to loot the taxpayers, and by the loss of jobs, GDP, and tax base that jobs offshoring forced by Wall Street caused. The Republicans are using the fight over the limit on new public debt to block Obamacare. The Republicans are right to oppose Obamacare, but they are opposing Obamacare largely for ideological reasons when there are very good sound reasons to oppose Obamacare. When Republicans for ideological reasons blocked a single-payer health system like the rest of the developed world has and, indeed, even some developing countries have, the Obama regime, needing a victory, went to the insurance companies and told them to come up with a health care plan that the insurance lobby could get passed by Congress. Obamacare was written by the private insurance industry with the goal of raising its profits with 50 million mandated new customers. Obamacare works for the insurance companies, but not for the uninsured. The cost of using Obamacare is prohibitive for those who most need the health coverage. The cost of the premiums net of the government subsidy is large. It amounts to a substantial pay cut for people struggling to pay their bills. In addition to the premium cost, it is prohibitive for hard pressed Americans to use the policies because of the deductibles and co-pays. For the very poor, who are thrown into Medicaid systems, any assets they might have, such as a home, are subject to confiscation to cover their Medicaid bills. The only people other than the insurance companies who benefit from Obamacare are the down and out who are devoid of all assets. This might prove to be a growing percentage of Americans. On September 19 the New York Times on the front page of the business section reported what I have reported for years: that real median family incomes in the US are where they were a quarter of a century ago. In other words, in a quarter of a century there has been no income growth for the median American family. In 2013, payroll employment is below where it was six years ago. During 2013 most of the new jobs, barely sufficient to stay even with population growth and insufficient to recover the job loss from the recession, have been part-time jobs that do not provide any discretionary income with which to drive a consumer economy. Obamacare has resulted in the health insurance companies, who thought that they would be living in high profits from the mandated health coverage, being outsmarted by employers, who have reduced their full-time workers to part-time in order to avoid Omamacare’s requirement to provide health coverage to those employees who work 30 hours a week or more. Employers can get away with this, because jobs are hard to find. The lack of employment opportunities results in Americans with engineering degrees working as retail sales clerks and as shelf stockers in Walmart and Home Depot. Despite the abundance of unemployed and under-employed American technical and engineering workers, the large corporations lobby Congress for more H-1B visas to bring in lowly paid foreigners with the argument that there is a shortage of qualified Americans for technical work. As I have pointed out so many times, if there were a shortage of engineering and technical workers, salaries would be rising, not falling. For millions of employees, Obamacare means cut hours and less take home pay plus out-of-pocket expenses to purchase an Obamacare health policy. For most people covered by Obamacare, this is a lose-lose situation. It is also a lose-loss situation for the vast majority of the young. Most young people, unless they have jobs that provide health coverage, do without it, because the chances of the young having heart attacks, cancer, and other serious health problems is low. 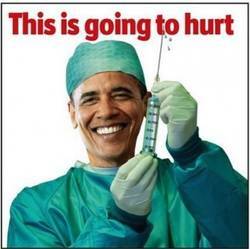 Obamacare, however, requires the healthy young to pay premiums for coverage or to pay a penalty to the IRS. In my day this might not have been a problem. However, today there are few jobs for the young that pay enough to have an independent existence. The monthly payroll jobs reports do not show well-paying jobs. The Labor Department’s projections of future jobs are not jobs that pay well. For the youth, it seems that the penalty is less than the premium, so youthful penalties paid out of waitress and bartender tips will subsidize the unusable Obamacare health policies for the poor adults who are not thrown into Medicaid, which confiscates their assets, if any. Obamacare benefits only two classes of people. It benefits employers who drop their employees working hours below the hours specified for Obamacare coverage, and it benefits the insurance companies or the IRS who collect the premiums and penalties. Many of the people who pay the premiums won’t be able to use the policies because of co-pays and deductions. The very poor with no assets might receive health care if they reside in states that accept the Medicaid provisions of Obamacare. In 21st century America, the few people who have experienced income gains are the executives and shareholders of firms who offshored their production for US markets, Wall Street which makes bets covered by the Federal Reserve, and the military-security complex which has been enriched by the neoconservatives’ wars. Every other American has lost. This entry was posted in Banksters, Constitution, Economy Economics, Obama and Company and tagged 2013 shutdown, corporatism, fascism, insurance industry bailout, neverending war, obamacare. Bookmark the permalink. Someday, when literacy returns to America, say in fifty years, these words will be read and puzzled over. So many fine phrases, so many warnings, so many fingers pointing at the moon, so many and nothing was done to avert catastrophe. The best flung words of warning like pebbles against giants but no David could be found to slay Goliath. So it came to pass that words failed to act and absent action more words were flung helplessly into the void as if nothing more could be done. We could revolt by not paying income tax. We revolt by not paying excise tax on phones. We could simply follow Gandhi and practice non-co-operation. In the end we talk and write and feel less disempowered because we intellectually know but these feelings are impotent. How much ink since Vietnam has been used to accomplish nothing? There is no stomach for sacrifice. We know government is failed and elections frauds but vote we do. We know and in our knowing fail to act on what we know. I am stating that we must recognize that freedom requires more than words. We can have a protest and then go home or we do not go home and never go home. Yes some will be hurt by the State, but we do outnumber them and it is in deeds we win not with rhetoric. For readers who are confused about the current US state of decadence – there is a legitimate reason for Congress to hold the country and the President to ransom. They realize that Obama is basically out of control. His “Obama-care”is a disaster for the public, contrary to the usual spin from his supporters. This article clarifies much of what is not generally known about the health care mess in the US.